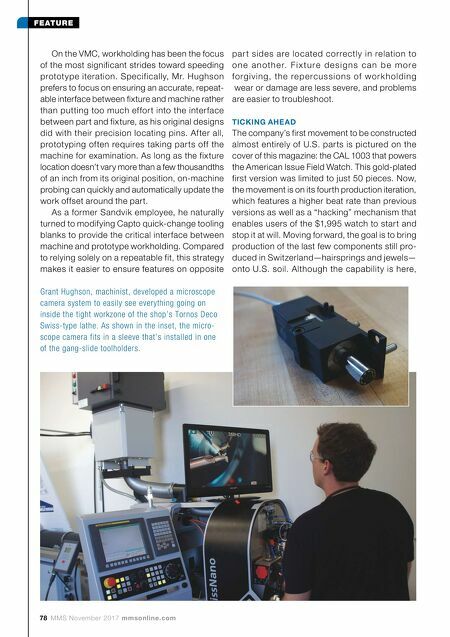 mmsonline.com November 2017 MMS 79 FEATURE Mr. Weiss says suppliers require the opportunity to produce at certain volumes before they'd even consider the work. He and Mr. Hughson alike expect scaling up from here to be an incremental process, as it's been from the beginning. "We're learning as we go along," Mr. Hughson says. That may be so, but the company has come a long way in four short years. It's done so by following essentially the same model that spawned t h e r e p u t a t i o n fo r U.S. watchmaking it a i m s t o r e s t o r e . Beginning in the mid- 19 th centur y, U.S. c o m p a n i e s l i k e Waltham Watch Co. supple me nted the Weiss Watch Co., call 213-587-2506 or visit weisswatchcompany.com Methods Machine Tools, call 978-443-5388 or visit methodsmachine.com Tornos Technologies U.S. Corp., call 630-812-2040 or visit tornos.us. The Swiss-type workzone is tight, but it provides the flexibility and the capability—particularly in the form of two high- speed milling spindles— to turn around tiny, delicate parts quickly. These first- and second-operation prototype fixtures for bridges and main plates mount to modified Capto quick-change tooling blocks (top) to ensure pre- cisely repeatable mounting. Holes machined into two opposing corners during the first operation are left accessible for second-operation probing routines, which use the hole locations and the angle of a diagonal formed between them to calculate offsets. technique of the Swiss masters with production equipment that made watche s cheaper and easier to make without compromising the craft, Mr. Weiss explains. The industry declined with the advent of quartz movements, but the Swiss managed to maintain their mechanical traditions, with the continuing success of brands like Rolex driven largely by enthusiasts who appreciate the engineering that goes into hand-assembled timepieces with hundreds of parts. 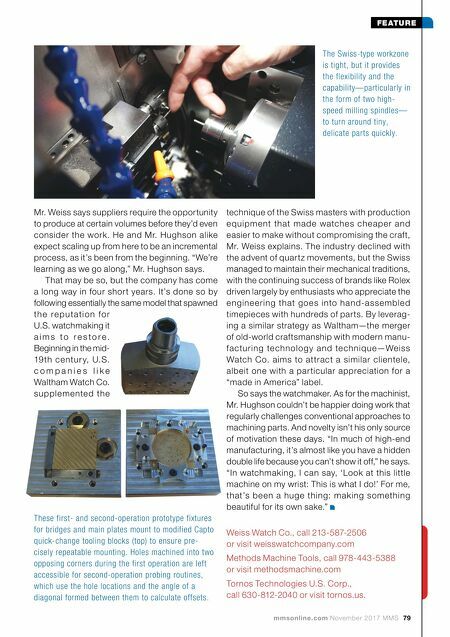 By leverag- ing a similar strategy as Waltham—the merger of old-world craftsmanship with modern manu- factur ing te chnolog y and te chnique—We is s Watch Co. aims to attract a similar clientele, albeit one with a par ticular appreciation for a "made in America" label. So says the watchmaker. As for the machinist, Mr. Hughson couldn't be happier doing work that regularly challenges conventional approaches to machining parts. And novelty isn't his only source of motivation these days. "In much of high-end manufacturing, it's almost like you have a hidden double life because you can't show it off," he says. "In watchmaking, I can say, 'Look at this little machine on my wrist: This is what I do!' For me, that's been a huge thing: making something beautiful for its own sake."